HCD offers nationwide distribution through 21 fulfillment centers across the U.S. allowing us to deliver to 98% of our customers within 1-2 days. At Home Care Delivered, we believe that caring for the customer starts with a promise; to deliver high quality medical supplies on time, every time. Through a careful selection of products with leading manufacturers and business partners, we offer national distribution to thousands of consumers on a monthly basis. We partner with organizations that share our values and our commitment to the customer. This shared vision of what matters most allows HCD to provide industry leading customer service and best-in-class claims processing. Our investments in technology have positioned HCD to provide best-in-industry reporting and monitoring of product sales. Our custom-developed software platforms optimize the distribution of products that are covered by Medicare, Medicaid and major private insurers. Not in the Home Care market? 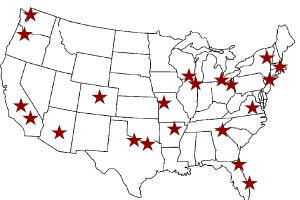 We offer you the opportunity to reach customers nationwide with your products and education. Our team works diligently with the patient to follow their plan of care and to make sure they have their products on time. Interested in partnering with HCD? Click here to Contact Us or call (800) 867-4412 for more information.